Ken Krall with Rep. Rob Swearingen(R-Rhinelander) and State Senator Janet Bewley(D-Mason). 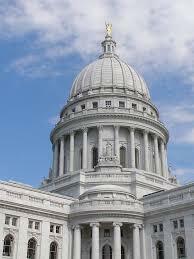 A middlle class tax cut passed the Wisconsin Assembly Tuesday. Governor Tony Evers has said he won't sign the bill because it relies on a budget surplus to cover lost revenue. Evers has proposed his own tax cut plan, half of it covered by putting new limits on tax credits for manufacturers. Republicans don't want to raise taxes on businesses to pay for the cuts. Representative Rob Swearingen of Rhinelander says the 2020 tax cuts are for families under $150,000 or individuals under $100,000. He says Republicans are following up on Governor Tony Evers' pledge for that tax cut. "...there is some opposition on how the tax cut should be placed using the budget surplus. The Governor would like to eliminate the manufacturing and agricultural tax credit which would be a tax increase,or at least a tax shift. The legislature doesn't agree with the Governor on that aspect. We hope the Governor reconsiders and passes our version of the tax cut...."
Before the Senate vote Wednesday, State Senator Janet Bewley had the Democrats view. She says Governor Evers has made a tax cut a centerpiece promise. But she says the move is questionable at this time because it will be addressed again later when Evers releases his budget on February 28. "..The Republicans want to take a different way of funding it, but also a different way to get it passed. Rather than wait for the budget, which is a better way of looking at all the things we do, how we spend our money, and how we gain revenue, (Republicans)want to pull it out and deal with it in a discreet way, which is kind of silly if you ask me because it could be completely undone when we pass the budget..."
Bewley says Evers would like to find an on-going revenue source to fund the tax cut, rather than a cut that always assumes a tax surplus. Governor-Elect Tony Evers held a listening session in Wausau Wednesday(12/12) to find out what Wisconsin residents would like to see prioritized in the next state budget. Evers says he's holding the sessions to make sure the people have a say early in the process.. "...I know the Joint Finance Committee goes around the state and does their input sessions but that's after it's kind of baked. We're in the process of making that, and we want people to be part of putting ingredients in that cake..."
Reactions fell along party lines after Governor Tony Evers gave his State of the State address Tuesday. Evers says the state needs to see a bipartisan approach to conducting its business. With Republicans holding big majorities in the Senate and Assembly, the new Democratic governor is hoping lawmakers will work with him on education funding and health care. Two Northwoods State Senators from different political parties saw different things in the speech.